Abdullah Mohammad SAAD (1985, Bangladesh) studied Didactics at the University of Dhaka, before switching to filmmaking. He has produced short films and television commercials with his own production company. 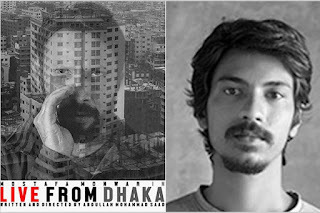 Live from Dhaka (2016) is his feature film debut. The film received Silver Screen Awards for Best Director and Best Performance (Mostafa Monwar) at the 27th Singapore International Film Festival. You studied Didactics at the University of Dhaka, before switching to filmmaking. How did that change occur? To be honest, I really don't know. I don't even remember why I started writing my first screenplay or what inspired me to do so. Of course I liked watching films. But it was never like I set out to create art nor that I always I wanted to be a filmmaker. I guess, at some point in my life, I realized that making films gives me a sense of purpose. I didn't mean to sound "deep". To be more accurate, filmmaking turned out to be the best way for me to live my life, even though it can make life super scary, anxious and depressing. You also own a production company that produces short films and television commercials. Can tell us a bit about it? Did you finance your film through it? I understood that to be able to make my film I would have to develop a production team first. I accepted the reality that I'd probably never find a producer who will do that for me or secure finance, given the independent film situation in Bangladesh. I feel very lucky to have some friends who always had faith in me. So, after forming the company with friends, I started making commercials to survive and save some money and build up a team. Eventually, that little money we saved financed the film and that's the team that worked in "Live From Dhaka". According to IMDB, "Live from Dhaka" cost about $10.000. How difficult is it to shoot a film with such a small budget? I don't think it was as difficult as it sounds. We knew from the very beginning that this is the money we have, so we must design the production according to it. The key was to be adaptive (some would say compromise :)). If we didn't get permission for a certain location or couldn't afford it, we tried to find another similar one or sometimes ended up in a very different one. I tried my best to frame and block the scene with whatever resources I had available, and to bring out the best performances from my actors in the most effective way I knew. But I'll admit the fact that I could really use a couple more shooting days. In the film, Sazzad has many troubles from the beginning, but his life seems to be getting worse. Why did you choose to make his story so tragic? I start with a character and a conflict. Then I try to understand the character by thinking how he deals with the conflict and feels about it. I always believed we can understand more about human condition by observing how one confronts crisis, especially those related to morality, rather than observing one's desires. So, I guess what I wanted to say is, after I created the conflict for Sazzad, the way he started dealing with it in my mind just kept bringing more and more conflicts and eventually made his life very difficult. The film features some live footage, from riots. Where are they from? Those are real archive footage, collected from local TV stations. How is the financial and social situation in Bangladesh at the moment? Why do so many people want to leave? Is there as much corruption as you portray in the film? I guess I am not the best person to talk about financial and social situation in Bangladesh. The reason people want to leave from here is the universal one. I think it's always the "hope" for a better life. The difference is that, sometimes, we choose to hope and sometimes we have to escape to find the hope. About corruption in my country, I better leave it to the experts. I believe the corruption I portrayed was only for the sake of the film, not to give any generalized idea about the situations in Bangladesh. What do you want to show with the tragedy portrayed at the end of the film? I don't think I meant the ending to be tragic. To be honest, I didn't want to mean anything at all. I just wanted to show a situation where Sazzad has to decide between morality and self preservation. I leave it up to the audience how to feel and think about Sazzad's action. Mostafa Monwar is great in the film. Why did you choose him for the role and how did you guide him? In general, how do you choose your actors? First of all, Mostafa had the perfect physical appearance I was looking for. And then the most powerful thing I discovered about him was that he has this rare ability to express anger, frustration and desperation, simply by looking at someone or something. We talked a lot about his character before we started shooting. I kept sending him every draft and we discussed. By the time we started shooting, he kind of became Sazzad and I didn't have to guide him every second. I only had to decide the degree of intensity he was playing in a certain scene. How did you shoot the scenes in the car? Why did you choose to have many brief scenes, much like vignettes. It seems like an expensive method. Actually I didn't shot the film that way, from the beginning. I came up with the style in editing. I didn't want to explain everything that was happening to Sazzad nor did I want it to be sentimental. So, I removed a lot of explanatory and sentimental parts which, at the end, defined the rhythm of the film. It felt right to me to be able to capture Sazzad's essence. What is the current situation in Bangladeshi cinema? The situation is promising. We have had some good films in the last couple of years. I am sure there will be more soon. Which are your most important influences as a director? I think my biggest influence came from Milan Kundera. His novels made me feel very different about understanding film as an art medium. I have been working on a new film project. Hope it will get made.